The tragic case of little Charlie Gard should be a wake-up call to every person of good will that if we don't fight for the natural family now while we still can, soon it may be too late. The state and Big Government will have amassed such power for itself, able to force its decrees on citizens, that average citizens will be virtually powerless to do anything about it. Parental rights will be trampled, and families will be destroyed in the process. We at the International Organization for the Family are determined to fight. Will you join us? The link (which I neutered) is to donations. Charlie is an eleven-month old baby with an incredibly rare, likely terminal disorder that interferes with his cells getting energy to muscles, the kidney and his brain. His parents, Connie and Chris, have secured crowdfunding to take him to the United States for experimental but potentially promising treatment. That is an outright lie. 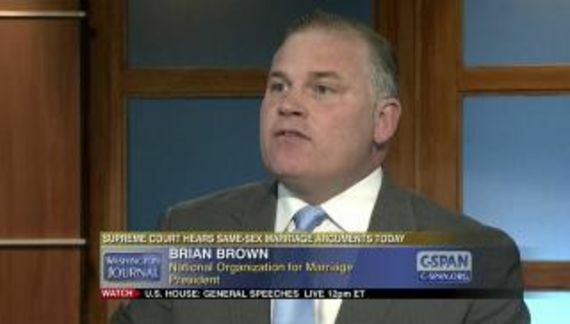 Brown is telling people what they want to hear. Card's illness is not “likely” terminal — It is definitely terminal. The only thing that treatment might do (if Charlie survived the flight) is to stop the the progression of the disease. The child is profoundly brain damaged. He would face a life in diapers without the ability to hear, speak, see or move. That is why the courts have ruled that Charlie should be allowed to die with dignity. But all that is unimportant to Brown. He wants people to donate to his little group and that takes precedence over humanity and good taste. This just demonstrates what a low-life Mr. Brown really is. In order to strengthen IOF's work and put us on a solid foundation for the future, we are asking supporters to become Sustaining Members by contributing as little as $7 per month. We've been blessed with a $100,000 Matching Gift offer, meaning that every monthly gift from a Sustaining Member will be matched dollar for dollar for each of the next twelve months! Please help us today by pledging a monthly gift and becoming a Sustaining Member. Yet another prevarication. Matching donors do not exist. Brown is simply restructuring money that has already been promised or received. It is a dishonest scam to attract small-money donors. These are the people who can least afford to support his cause. This thing is quite verbose. Shame on Brown and his organization. People of conscience do not exploit dying children to raise money. Particularly not for a cause that has no relationship to the dying child. Simply disgusting.